Are you designing a new business and looking for the right questions to ask yourself how to make this business successful? 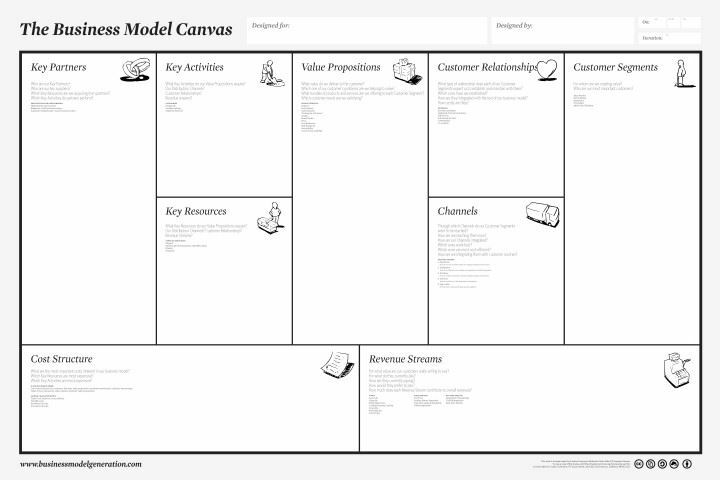 Download this free Business Model Canvas A3 size poster template now and achieve your goals faster! For those individuals, who make the biggest impacts, have, what we call, a "high performance mindset” and are often using the best templates, obtaining the right information and asking themselves the right questions! By going through this template and filling in the questions, you will know soon how successful your business idea will be and what to improve. Who are our Key Partners? Who are our key suppliers? Which Key Resources are we acquiring from partners? Which Key Activities do partners perform? What Key Activities do our Value Propositions require? Our Distribution Channels? What bundles of products and services are we offering to each Customer Segment? Which customer needs are we satisfying? What type of relationship does each of our Customer Segments expect us to establish and maintain with them? Which ones have we established? What are the most important costs inherent in our business model? Which Key Resources are most expensive? For what value are our customers really willing to pay? For what do they currently pay? Try out our online free business templates, forms and contracts today. Save, fill-In the blanks, print …and done! Top 10 Webshop templates for Webshop owners! Find here the best web shop templates online and use them to improve your webshop's image, efficiency and effectiveness!